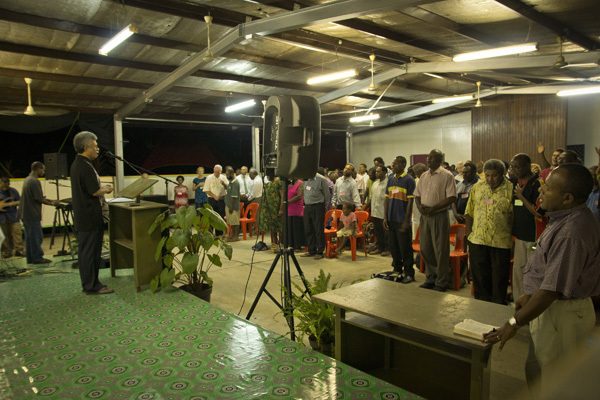 One hundred twenty-six church pastors and leaders from seventeen church denominations came from all over Madang province to attend the “Power in the Word” conference hosted by the Crossroad Baptist Church. The conference was organised by the Madang Pastors Fraternal with help from PNG Bible Translation Association (BTA), Pioneer Bible Translators and SIL-PNG. The conference began with a focus on repentance and a time of prayer for the churches, communities and the nation. The next three days were filled with sessions that encouraged and strengthened the leaders. These sessions helped the leaders to see new ways of using the Scriptures in their churches. Topics such as “Power of the Word”, “Using the Vernacular Scriptures”, “Oral Bible Storytelling” and “Preaching and Praying in Tokples” proved invaluable to the pastors. Other sessions focused on overcoming trials facing the churches. Presentations on “Hindrances to Using the Word”, “Melanesian Spiritism”, “Disunity” and “Western Humanism and Secularism” challenged the leaders to face the issues in their churches with the power of the Word. There were also practical sessions led by representatives from Christian Book Melanesia, Christian Radio Missionary Fellowship, SIL-PNG, Faith Comes by Hearing and Youth with a Mission. Participants were highly interested in the presentation about Scripture Application and Leadership Training (SALT), a program that equips national pastors and leaders in PNG to effectively use translated Scriptures in church ministries. Church leaders in Madang town want to take the training so that they can share it in the rural areas surrounding Madang. The conference generated a feeling of unity among the pastors and leaders as they saw the need to work together. The “Word” was seen as the common denominator for all churches and denominations—and the translated Word was seen as the best way to express God’s truth to the hearts of those in their congregations. This church conference of pastors and leaders all coming together to praise the Lord and profess their need for more unity and cooperation among national Papuan churches is most exciting to us. This is an answer to our prayers of many years, to see the national churches come alive and not just see the magnitude of the task of evangelizing their own people group and others, but also to really start taking on this task, and doing it arm-in-arm with leaders of other denominations. Even more incredible is that fact that many of them are now clearly seeing that evangelization of their people will be much more fruitful if they use translated Scriptures in their own language. Putting it another way, Bible translation is now being seen as essential for pastors and leaders to more effectively do evangelism among their own people. And the spirit of unity which swept through the group was certainly an awesome thing to experience. Almost makes you think of what it was like in those early days when the Holy Spirit broke forth during the Day of Penetost and the church exploded in very incredible ways. As I now begin my long journey from North America back to Papua New Guinea, I am excited to think of the groundwork with has already been laid down by all these faithful Papuan pastors and leaders. 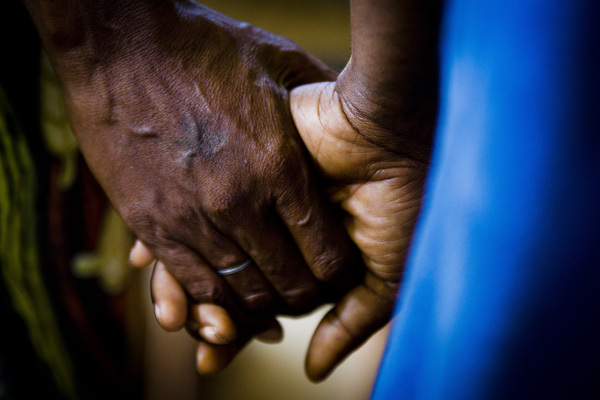 It is very obvious that God is moving among them, no matter what their denominational flavor they may be, to bring them all to their knees in repentant spirits and to hold one another’s hand in the sign of Christian unity over there. This will definitely be a real boost to the work which I do in PNG. I have a burning passion to train nationals to learn the “Principles of Bible Translation“, guide them in other skills and knowledge they will need, and then send them back out to their villages to do Bible translation among their own people. There are so many stories that tell how the task of Bible translation so very often ends up with the result that the translated Word of God grabs hold of their own hearts and we see the lives of the translators become transformed for Christ right before our eyes. So as I said above, I am very eager to get back to PNG and to see what great and awesome things God has done during these four months that I have been away. And I am excited about the fact that a real passion for Bible translation has now begun among these churches. Christ himself said that the gates of hell could not prevail against the church. Now think how powerful and effective the changing of lives will be when we see more and more church support being put into the Bible translation movement that is representative of what our mission does, Pioneer Bible Translators. Thanks Norm, it sound like it was an exciting time. So exciting Norm! There will no doubt be immense fruit from the unity of His church in bringing His word to His people…. We will continue to pray for this and for more national translators. and Joseph and his brothers. Right in the midst of that conversation, 2 little boys were ushered to the rocks to sit between us, while a couple of ladies prepped them for photos that they were taking. “Sit up straight. Put your arms around each other.” etc. I asked if the boys were buddies or cousins. She said “Brothers! Can’t you tell!” I admittedly hadn’t really noticed any tension/problem between the 2. I noticed more how the mom wanted them to at least act as though they loved each other. It was one of those surreal moments where it seems like you’re watching a scene. Their actions were dramatic. I went over to the other lady as she was getting ready to go and said that that was a good picture of the church. We’re brothers and sometimes we don’t get along, but we’re still family. And our Heavenly Father is watching on, trying to get us to get along and really love one another. How good it was to hear of this in PNG and that PBT-C is a part. How glad His heart must be. Blessings on your travels Norm. Norm, We are so grateful that you have returned to PNG and will begin this work that you wrote about. We are so thrilled to know that the church there is really working to get united to share God’s Word. Praising God and thanking Him for the passion He is giving you ,Norman, and the wisdom to train people to translate the Word in their own villages amongst their own people. Continuing in prayer for this great desire and the work ahead for you,Norman and the people with whom you work/teach!